Formation of the Inniskilling Regiment of Foot, later 27th Regiment. Tiffin's and Lloyd's Inniskilling Regiments inspected at Dundalk. Formation of the Inniskilling Regiment of Foot. The raising of the Inniskillings. 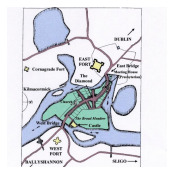 The Inniskillings came into official existence on 20 June 1689 and was one of the three regiments of foot formed in Enniskillen. When the order of precedence of British regiments was fixed, English regiments were granted precedence according to the dates of their formation. Irish and Scottish regiments, regardless of when they were raised, took their precedence from the dates they were taken onto the English army establishment for the first time. 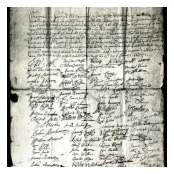 The Inniskillings were fortunate that the board of general officers appointed to decide precedence ruled that it should be dated not 1 January 1690, when the regiment was placed by Royal Warrant on the English army establishment, but rather 20 June 1689. 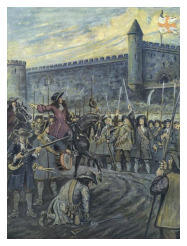 In 1689, the Catholic King, James II, was deposed and fled. Seeking Irish support to recover his throne, he landed in Ireland with French troops and raised an Army. The Protestant people of Inniskilling (now Enniskillen) and the surrounding counties armed themselves to resist occupation by James's troops. 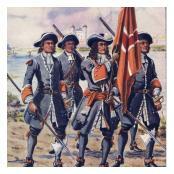 They formed Foot and Horse regiments dressed in grey uniforms. They fortified the town and brought in all the boats on the lough. Patrols went out by night. The residents declared 'We stand upon our guard, and do resolve by the blessing of God to meet our danger rather than to expect it'. They defeated James's men at Omagh, Ballyshannon, Sligo and Kells. 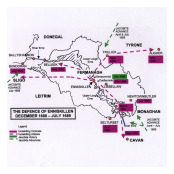 This provoked attacks on Enniskillen and the Inniskillings were defeated on the outskirts of the town but later routed the enemy at Newtownbutler. Following this, the Inniskillings joined the army of the new King William III and over the next years fought at the Boyne, Athlone, Aughrim and Limerick.